Once in a while you get something like this. The good news: You made nothing wrong, it is our fault. 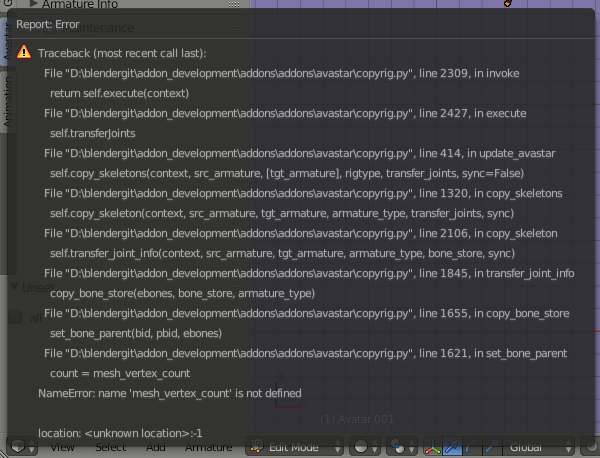 What you see here is an error that happened deep inside the Avastar program. 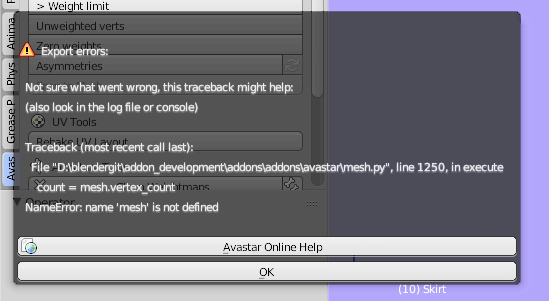 The program simply could not do what the programmer wanted it to do, so Avastar made a full stop and sent a report to the error console. This report is also named Traceback. We really want to know about Tracebacks. Always! Otherwise just make a screenshot of the Traceback. Hint: If the Traceback is very long, we only are interested in the lower part of it (the last 10-20 lines). Take a look a the first screenshot above. You read it from bottom to top. And to begin with: ignore the line telling about unknown location. That is actually not relevant for us. All you need to do is: report it to us! We won’t find this error otherwise.